Matsya Vyavsay Vikas Vibhag Bharti 2019 for 79 posts is declared by the Department of Fisheries. Matsya Vyavsay Vikas Vibhag Bharti is conducted under the Maharashtra Mega Bharti 2019 in all the districts of Maharashtra. As this Matsya Vyavsay Vikas Vibhag Recruitment is announced for the post, Assistant Fishery Development Officer, Group C, there is a very best chance for students to do a government job. Assistant Fishery Development Officer Bharti Online Application is starting from 29 December 2018 and the last date for submitting online application form is 21 January 2019. In this article, you will get all the important information regarding Application Form Date, Eligibility Criteria, Selection Process, Educational Qualification, Age Limit etc. for Fisheries Department Recruitment. Read below information carefully and then start filling an online application form to avoid mistakes. मत्स्यव्यवसाय विकास विभागात भरती जाहीर करण्यात आली आहे. 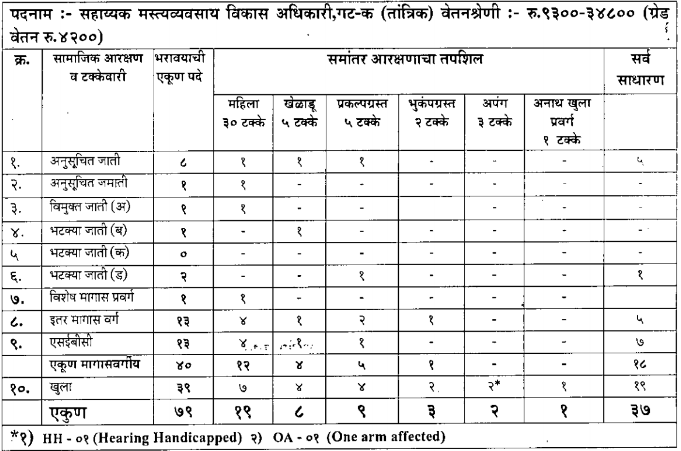 सहाय्यक मत्स्यव्यवसाय विकास अधिकारी, गट क या पदाच्या एकूण 79 जागांसाठी ऑनलाईन अर्ज मागविण्यात येत आहे. 29 डिसेंबर 2018 ते 21 जानेवारी 2019 पर्यंत अर्ज करू शकता. अधिक माहितीसाठी खालील पोस्ट सविस्तर वाचा. Age Limit Candidate age as on 19th January 2019, should be in between 18 to 38 years and for backward category applicants 5 years age relaxations is applicable. Click on the above links to get information about Talathi & ZP Bharti. You need to open the official website from Here for filling the online application form for Matsya Vyavsay Vikas Vibhag Recruitment. You need to keep a soft copy of your passport size photo and your own signature while applying for any post. Also, carry a Credit card or Debit card (If you don’t have Net Banking) with you for paying Application Fees. This is the best method to pay fees online than Chalan process. After Submitting an online application form, don’t forget to take print out of your application form. So, Dear Aspirants, Start your study, planned well and hit the success. MPSC World is always with you to encourage you in every step of educational life. Matsya Vyavsay Vikas Vibhag Bharti is started by Matsya Vyavsay Vikas Vibhag, Maharashtra. Matsya Vyavsay Vikas Vibhag Bharti is going to conduct under Maharashtra Mega Bharti. Maharashtra government officially declares about “Maharashtra Mega Bharti” before some days. In the Mega Bharti, There are many departments for which recruitment process will start and these departments come under Zilla Parishad. Matsya Vyavsay Vikas Vibhag is also one of the departments for which this Mega Bharti conducting in Maharashtra. In Matsya Vyavsay Vikas Vibhag Recruitment, for the total of 90 posts inviting to fill the online application form. This recruitment conducting for Group “B” and Group “C” level posts. 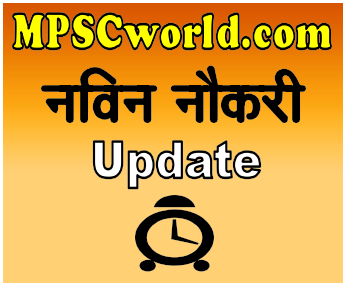 Here we will update you everything about Matsya Vyavsay Vikas Vibhag Recruitment 2018 – 2019. Matsya Vyavsay Vikas Vibhag Recruitment is going to conduct in all districts of Maharashtra. Here we are providing all the details regarding Matsya Vyavsay Vikas Vibhag Bharti of all districts. Bharti process is still pending in many districts, so there is no link given below regarding pending districts. We will update here when any other district published notification regarding Matsya Vyavsay Vikas Vibhag Bharti. Please check below links of your respective district. महाराष्ट्र मत्स्य व्यवसाय विकास विभागात लवकरच मेगा भरती अंतर्गत भरती होणार आहे. फेब्रुवारी 2019 मध्ये परीक्षा होईल. या भरतीविषयी सर्व माहिती या ठिकाणी Update करण्यात येईल. धन्यवाद. As we already posted about total vacancies in Matsya Vyavsay Vikas Vibhag Recruitment i.e. 90 Posts are going to recruit in this Mega Bharti. Below are some highlights of this recruitment. In the Matsya Vyavsay Vikas Vibhag exam, Overall 25% of the syllabus is on History And Geography of applicants district. So you have to study well about history and geography of your own district. Also, Matsya Vyavsay Vikas Vibhag exam will be conducted on the same day in the whole Maharashtra. You can get ZP Exam Syllabus from here.